I find it quite interesting that the debate continues over the theory of peak oil. Someone sent me a link recently to a piece about a giant oil field located in Alaska that supposedly the government capped and refuses to let the energy companies develop. I like conspiracy theories for the same reason everyone else does. No matter how convoluted the logic, since a conspiracy theory can be anything, you can’t disprove it. Peak Oil is real and it’s not in the future, it was actually in May of 2005 but you won’t hear much about it in the MSM. If we had truth in reporting laws, the Main Stream Media would have to be renamed the Main Stream Propaganda; it bears no resemblance to news or truth. Alas, we passed world peak oil production over three years ago. Production was less in 2006, even lower in 2007 and still lower in 2008. Prices are high because demand exceeds supply. One of the truly exciting aspects of my job is that now and again I see something revoltunary, something earthshaking. I got a call six months about asking me to come to Alberta to visit a new process for separating oil from the water associated with it. I flew up in early April, just in time to catch a springtime snow in Alberta. I went to see Wescorp’s brand new 2000 bpd water remediation test unit. I learned a lot on the trip. I thought you drilled a well, found oil and it either flowed or you pumped it out of the ground. It’s not quite that simple. Since all oil came from the bottom of the ocean, all oil is associated with salt water. You can get oil with virtually no water. When water flooding a reservoir, you can get 99% water. When you pump oil from the ground, most of the time you are also pumping 4-20 barrels of water as well. The water is contaminated with both oil and solids (basically sand). The oilfield operator needs to do two things. He wants to recover as much oil as possible and he wants to get rid of the water the easiest and cheapest way. The water remediation unit produced and patented by Wescorp is simple in theory. You feed ultra tiny bubbles of natural gas or nitrogen through a tank of contaminated water. I think the 2000 bpd unit I saw had a green 12-foot upright tank. I was told the bubbles are so tiny that they take 28 minutes to travel from the bottom of the tank to the top. Oil is lighter than water so they collect the now free oil at the top of the tank and the solids from the bottom of the tank. 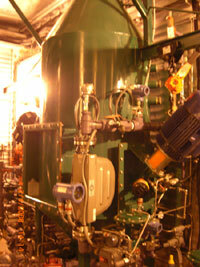 New fluids are constantly fed into the tank so a 220-liter tank can process 2000 bpd of fluids. It’s very important to understand that the contaminated water cannot simply be fed back into the existing well. It is contaminated with sands and solids and would soon clog up the entire reservoir so no oil would be produced. So every field has exhausted wells where contaminated water can be pumped. Often the fluids have to be trucked, adding additional cost. I want all my readers to understand I believe in Peak Oil. It’s a giant problem and it’s going to affect all of us in ways we cannot imagine today. Our lives are going to change in a big way and many of those changes will be negative. Oil is certainly part of the basis of the resource wars that have already begun. We need to conserve energy. That’s obvious to everyone. Less obvious to everyone is the critical need to improve the efficiency of oil field operations. Solving the water remediation problem goes a long way to cutting massive costs that are simply out of control. The conventional technology used today to remediate water leaves oil contamination of .5% to 3%. Wescorp can improve that to .005% (50 parts per million). Wescorp estimates that with a 2000 barrel per day unit, the operator can recover between 10 and 60 barrels of additional oil per day. With the lease rate of a 2000 bpd unit at $1400 per day, the additional oil recovery can more than pay for the price of a unit. In addition, the now uncontaminated water can be pumped down nearby existing old production wells saving very expensive trucking costs and improving production of oil. Where these units are really going to prove their value is in the Alberta tar sands where 1.5 million barrels of water a day are used in the production of heavy oil from the sands. The constraining limit for production isn’t capital or tar sands, it’s water. Existing operations are licensed to use 2.5 billion barrels of water a year from the Athabasca River. Wescorp has the best water remediation unit by an order of magnitude. I was told that up to 3% more oil could be produced from the tar sands just recovering the oil from the contaminated water. That’s giant. The magic for investors isn’t just in this being such an environmentally friendly process. It’s going to make a lot of money for Wescorp. I saw the first unit put into production in April and I was very impressed. All the numbers worked. 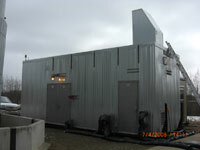 For $1400 a day, the operator was saving $4,000-$6,000 per day in expenses for filters, trucking and contaminating wells. But there is a world of difference between a company having a great theory and having a great stock. Theories are both common and expensive to investors. I cannot tell you how many times I have been made promises of what a company intended to do and how little it had in common with what they really did. I didn’t want to write up a story on a great theory. I waited because I wanted to see a real order. If the test unit was so good, someone else would have to recognize it as well for it to get my stamp of approval. The first order for water remediation units came on July 28th with the announcement of a 256-unit order to a Texas based production company. Here’s how it’s going to work. Wescorp is not selling the units. They lease them on a daily basis. 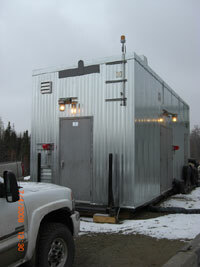 The units can be configured in five different sizes, 200, 500, 1000, 2000 and 5000 bpd capacity. Lease rates are between $900 and $2500 a day and that number is automatically adjusted for inflation. Wescorp will be delivering the units over a 5-year period. I’ve learned that Wescorp has an average of $1400 per day lease over all and the units pay for themselves in about seven months. So if we ignore the delivery time spreading out over five years, it means that seven months after a unit goes in, it becomes a cash cow to the company. Seven months after all the units are in place; Wescorp will have cash flow of about $130 million dollars a year. This is in a company with a market cap of a little over $30 million right now. There really isn’t any limit to the potential for the company. I would expect similar size orders to be coming in in the next weeks or months. When the market realizes the potential, this is going to be one of the big hits in the energy business. The only real limit is how fast they can train technicians. I asked about what was proprietary in the units and there isn’t much. It’s patented so can’t be copied legally but most of the components are off the shelf so there is no particular problem with production delays. And installing the units over a period of time gives Wescorp time to hire and train technicians. I love it. I loved it when I first saw it. We own shares and are participating in a private placement in the company. Wescorp is an advertiser and we are biased. I encourage potential investors to do their own due diligence and the math. This is a winner.